The 2015 Email Evolution Conference (#EEC15) just wrapped up, and the closing act was a noteworthy one. 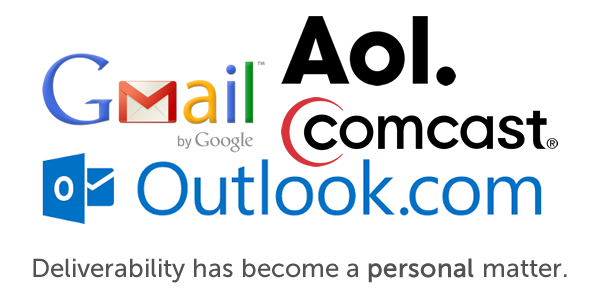 Four of the largest ISPs on one side, email marketers on the other. Paul Rock (AOL), Matthew Moleski (Comcast), Sri Somanchi (Gmail), and John Scarrow (Outlook.com) answered questions by Dennis Dayman (ReturnPath), Ryan Phelan (Acxiom Digital Impact), and many in the audience. Do opens matter? And clicks? Is sender reputation affected by inactive recipients? What else matters? What doesn’t? Before I forget, here are my notes on what the big 4 ISPs shared with us on email engagement! What does inbox engagement really mean? The inbox is not a “global” concept: my inbox is different than everyone else’s. That’s how the Big 4 all see it: sender reputation and inboxing are two different concepts. Your company may have stellar sender reputation, and yet a specific message may end up in the junk folder in my particular inbox. Why? Because I’ve shown that it’s not relevant to me, although it may be to many other people. What defines messages that go into the junk folder? Nothing, really. There is no real definition of SPAM. It’s all about the mix of signals that are constantly monitored and that indicate to the ISP whether a message is or is not relevant to a specific recipient. Of course, there is a textbook definition of SPAM, but it doesn’t help much in figuring out why your “Best Sellers” campaign ended up in my junk folder. None of the Big 4 tracks clicks. They see it as a violation of privacy, and they simply don’t do it. Whether a recipient clicks or not, therefore, has no impact whatsoever on engagement. The Big 4 – instead – all agreed that these seven signals of inbox engagement play a fundamental part in determining the relevancy of your email campaigns for a specific recipient. Reply (GOOD): a reply to a message is considered a super-strong signal of engagement. If you ever needed evidence that using a “no-reply@…” email address is a bad idea… here we go! Move to junk (BAD): strong, negative signal. Two of these on AOL are enough to automatically place that message in the spam folder from then on, for that recipient. Not junk (GOOD): strong, positive signal that the message should not be considered spam. One of these on AOL is enough to “reset” the previous behavior. Delete without open (BAD): a quick glance at the sender/subject, and they didn’t like it: a negative signal. Move to folder (GOOD): if you are moving certain messages around, it means you care about them. Add to address book (GOOD): it shows that the sender matters to the recipient. In the case of Outlook.com, only number three – flagging a message as spam – hurts the overall sender reputation. The rest affects inbox personalization (whether a message ends up in the inbox for a specific recipient), but not overall reputation. For the other three, all signals affect both reputation and individual personalization. Inactive recipients: what should you do? Should you automatically get rid of recipients that have been inactive for 12 months or more? Outlook.com‘s John Scarrow said “no”. Don’t get rid of them. They do not directly affect your sender reputation. The only way they could hurt your overall sender reputation is if they flagged your messages as spam. That doesn’t mean that you won’t end up in the junk folder, though. You need to separate the concepts of sender reputation and personal inbox preference: your reputation may be good (no one flags you as a spammer), but if there is no engagement, your message may not inbox. If there is still no engagement with the modified frequency, pop the big question after 3 to 6 months: do you want to continue hearing from us? If there is still no answer, it’s time to let them go, in Gmail’s view. It’s what Gmail recommends to the Google marketing teams. Finding good emails is like finding a needle in a haystack: around 95% of all email messages received by the Big 4 has no value and needs to be thrown out. Email marketers that follow best practices are obviously part of the other 5%, but they can’t forget that the receivers spend a lot of time and resources on filtering those bad senders. In other words: they have their hands full. All of the ISPs agreed that non-authenticated mass emails are a non-starter. If they cannot figure out who you are, it’s likely you’ll end up in the junk folder (or not be delivered at all). Make sure that you have basic authentication in place, such as adding a SPF record to your sending domain. AOL has its own internal blacklist: if you end up there, you’re in real trouble (automatic block) and the only way to get off of it is to contact the Abuse desk. Your presence in other blacklists, instead, is seen as one of many variables in the overall sender reputation equation. For Gmail, blacklists are just one of thousands of signals. The same is true for Outlook.com: John Scarrow likened blacklisting to points on a driver’s license. Same for Comcast: a member of the audience pointed out that Comcast appears to give substantial weight to the Cloudmark blacklist, and that it’s difficult for businesses to be removed from it: Matthew Moleski replied that a removal request is the way to go. They don’t matter. ISPs don’t look at that sort of thing at all. That said, if certain words trigger certain behaviors (e.g. Delete without open, see above), they could certainly have an impact on inboxing for those recipients. Right acquisition: start by following best practices when getting people to opt in. Sri Somanchi had a final word of advice: promotions are meant to be in the Promotions tab. Don’t try to game the system. If you are offered some sort of back way into the Primary tab, don’t listen to those consultants. He was very clear on that. You’ve been warned. Lots of interesting content. Hopefully it can help you better understand what happens in that mysterious place called the inbox once you hit “Send”. In the end, the big takeaway from the discussion was described well by EEC’s 2015 Email Marketer Thought Leader of the Year award winner Justine Jordan: deliverability has become personalized. What goes in the inbox for me, may not for you. What I might consider irrelevant, might be relevant for you. What I flag as SPAM and move to the junk fonder, you might flag as “NOT SPAM” and put back in the inbox. Deliverability has become a personal matter. One more reason to treat each of your email recipients as individuals, learn from what they like and dislike, and adjust your email marketing accordingly. Our friends at Email Copilot also provided coverage of this interesting session, and in their article you can find some additional details on what was discussed with regard to blacklists, domain- vs. IP-based reputation, and spamtraps. Check it out.